This wilderness park is situated in old growth forest, and is an attraction for those people who have planned for backcountry adventure. There is opportunity for solitude and isolation here, as activities are usually out of sight and sound of other users. Swan Lake is a large lake with unpredictable weather patterns and frequent strong winds. Never overestimate your paddling abilities in high wind and waves. There are dangerous rocks at the entrance to Club Lake. Exercise caution at this location and around the many islands of Swan Lake that have submerged reefs. 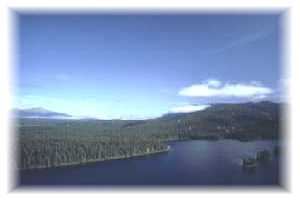 Swan Lake/Kispiox River Provincial Park is located about 75 km northwest of Hazelton. The main access is via Highway 37, which heads north from Highway 16 at Kitwanga Junction. The turn-off on the east side of the highway is Brown Bear Forest Service Road. Follow this road for approximately 14 km until you see Brown Bear Lake sign. Turn right on this road and follow it for 3km to the parking area and information shelter. The majority of the park is inaccessible by foot or vehicle. Canoe/Kayak: Swan Lake/Kispiox River Park offers a spectacular chain of lakes ideal for a canoe portage trip. Access is from the north end of Brown Bear Lake leading through Swan, Club and Stephens Lakes. Numerous rustic campsites are located along the lakes. Electric Motors Only: Brown Bear and Swan Lakes permit “Electric Motors Only.” No boat launch available. Lakes: This lake complex provides spawning and rearing habitat for Coho, Chinook, Sockeye, Chum, Pink and Steelhead that migrate up the Kispiox River each summer. As well, the lakes support a healthy population of resident Rainbow trout, Cutthroat trout, Dolly Varden char and Whitefish. Freshwater Fisheries Society of BC. At the southeast end of Brown Bear Lake there is a 1.4 km portage trail to Swan Lake. For your own safety and the preservation of the park, obey posted signs and keep to designated trails. Shortcutting trails destroys plant life and soil structure. Hunting is permitted within Swan Lake Kispiox River Provincial Park, though some species are authorized under Limited Entry Hunting only. Hunting for moose, grizzly bear, and mountain goat, is restricted to Limited Entry Hunting only. Please refer to the Hunting and Trapping Regulations Synopsis as well as the Limited Entry Hunting Synopsis for bag limits, season dates and area maps. Excellent wildlife viewing opportunities exist throughout the Swan Lake/Kispiox River Park. The lake chain in the southwest portion of the park contains a large diversity of wildlife and fish habitats. This lake complex provides spawning and rearing habitat for Coho, Chinook, Sockeye, Chum, Pink and Steelhead that migrate up the Kispiox River each summer. As well, the lakes support a healthy population of resident Rainbow trout, Cutthroat trout, Dolly Varden char and Whitefish. The abundant population of salmon helps attract and support a significant population of grizzly bears. This area is also excellent for black bears, mountain goats, wolves, moose, beaver, river otter and mink. Many forest bird species are present. Sightings of bald eagles and osprey are common. Gulls, terns and loons are abundant as well as waterfowl such as swans, buffleheads, goldeneyes, and common mergansers. Trumpeter swans are known to winter on Club Creek, given its open water conditions in most years. While campfires are allowed in this backcountry area, we encourage visitors to conserve wood and protect the environment by minimizing the use of fire and using camp stoves instead. When having fires please use dead, downed wood. Do not cut live vegetation. A wilderness campground with a metal bear-proof food cache and a pit toilet is located at the Swan Lake end of the portage trail from Brown Bear Lake. There are clear spots suitable for camping on a number of the islands throughout Swan Lake and at several spots along Brown Bear Lake but there are no facilities at any of these sites.